My sister and her family lived in Thailand for about 5 years and I would visit her every chance I got. Thai cuisine....*swoon*. It was love at first bite for sure! Thai cuisine is light, healthy but definitely screaming with flavor. I loved it so much that I even opened a humble food stall during the Christmas season of 2009. The menu was humble, only 3 dishes; Som Tam (Green Papaya Salad), Khao Phad (Thai Fried Rice), Cha Yen (Thai Iced Tea). Now that's an idea for my next posts! 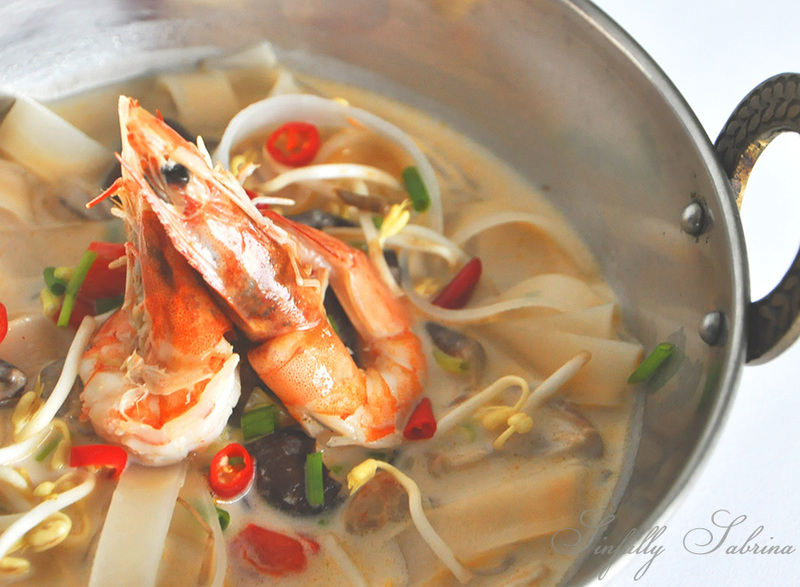 For the meantime, below is a recipe for Thai Shrimp Noodle soup that I made for my family during a rainy afternoon. What's your favorite Thai dish? Saute lemongrass, shallots, ginger, kaffir lime leaves and red bell pepper in some oil for about 2-3 minutes. Add shrimps and shitake mushrooms. Cook for 3-5 minutes. Add coconut milk, cocnut cream, shrimp stock and water. Season with fish sauce, to taste. Bring to a boil, 5 minutes. Simmer for 15 minutes. Add rice noodles, and simmer for another 5 minutes. Mix in bean sprouts. Squeeze a lime over the soup and garnish with coriander leaves, spring onions and sili labuyo.